Does anyone know the formula for calculating Brain Freeze procs for each of the mage bombs? Obviously FB is 100% per cast but I wasn't sure on % chance per tick for NT or LB. It was said on MMO that LB has x3 chance to trigger trink/chant/gem procs compared to NT. I would assume it holds true for BF as well. You meant 9% per NT tick, right? Great find Oltier! Good to know that multidotting does not increase Brain Freeze procs. I'm now wondering if mage bomb choice (NT or LB) could depend on haste breakpoints? For instance if you were at a haste rating between 15 NT ticks and 6 LB ticks would the Brain Freeze proc chance make enough difference to effect your choice? And how accurately does simcraft model this? Well, I guess you've seen the mmo-champion link in the trinket choice topic here. Basically the thing is, if you can reach the next Living bomb haste cap, LB is better. However, because NT scales better with haste, somewhere between the two LB haste caps, NT will be better until the next LB haste cap. If you see what I mean..
Like here: If you are at 9522 haste, go for LB. At 12684 haste, with RPPM trinkets, unglyphed Icy veins, meta gem, NT already pulls ahead. At 15832 NT is definitely better no arguement. +6 ticks to 12 base ticks = 18 ticks per one NT cast. +2 ticks to 4 base ticks = 6 ticks per one LB cast. 0.12 FFB times FFB damage, which is what? 150-ish? is equal to +18k damage. However, with NT ticking so fast, BF might overlap, entirely wasting the proc. Much less likely with LB. On a side note, may we have a brief discussion regarding haste breakpoints again? 1) Haste is not the same thing as haste breakpoint. Value of haste is not being discussed. 2) Haste breakpoints add a tick, therefore they increase damage per cast of NT. at haste breakpoint NT duration is extended by almost a second, so you can refresh it less times thus focusing on main target. 4) If we are talking about pure single-target fight, like Jin-Rokh, haste breakpoints DO NOT matter in any way. Less ticks per cast, less duration, less damage per cast, more casts, same number of overall ticks, same DPS. There has already been a same discussion on mmo-champ which I'm sure you have read as well. Here there has been an answer that I totally agree with, and most players, theory crafters on the forum as well. 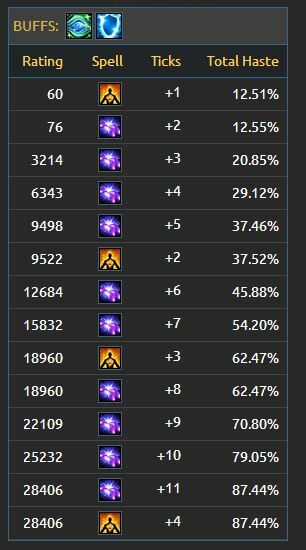 I do not agree that adding a tick at the breakpoint increases the DPS on NT since the duration is also increased at the breakpoint (ignoring offshoots and extra brainfreeze procs... I'm isolating NT and how dots work for this point). "I agree that you can get extra brainfreeze procs with more ticks"
Actually, this one is wrong. Total number of ticks is not dependant on breakpoints. Agreed on the rest. Thank you. Just was making sure I'm not missing anything. Thanks guys! Just finished the entire read on MMO-Champ. Great info. Well... Imo, more ticks=more chance. 12*9% chance, and 13*9% chance under the same period of time is indeed a higher number of procs. The question is. Can you use all up? Time between ticks does not change after a player hits the breakpoint. And yes, I think I, as many other mages, fail to consume all BF procs. It's not worth /stopcasting macro, and RNG gods don't always play in our favor. I deem BF procs as a great advantage of LB, actually. Then agan, it's all been said already and there's no point to repeat it. Sorry. Edit: Actually, there is one thing. Is there any in-game option (i'm aware of WoL counting procs and casts) to check how many procs I've wasted? Does Combustion helper do it? If I've heard correctly, it has an option to spam your chat with warnings of early bomb refreshes etc. Under the same period of time, as you heard. At 9498 haste you have 5 ticks under 12 seconds. At 12684, you have 6 ticks under 12 seconds. Thus, you have more 1* more 9% chance to trigger BF. I don't know about these settings, but if you have WoLs, you can check the number of BF aura procs and the number of casted FFBs. I thought the final consensus was that the frequency of the ticks scales linearly with haste and there was no advantage at breakpoints? As far as I know, they were only debating about NT not considering any other factors (like BF procs etc), but purely NT. Correct me if I'm wrong. I am going to run through the topic once again tho. Some people keep mentioning Brain Freeze: it is irrelevant in this discussion: it doesn't matter if each cast of NT ticks 17 times total or 18 times total, all you care about is the frequency with which you are generating events that can trigger Brain Freeze. If you add 1 haste rating, it doesn't matter if you cross a threshold -- your frequency is virtually unchanged, and thus the total number of events in a fight that could trigger BF is unchanged. So that's another distraction we can strip away to get at the heart of the discussion here. Akraen - "This is correct. The duration of the NT DoT will fluctuate with the frequency of each tick as haste is stacked linearly. Gaining haste always helps BF procs, you don't need breakpoints for that."